Chicken…it’s what’s for dinner! And there are so many ways to prepare it, but this is a no fail recipe for baked honey mustard chicken. It’s as easy as browning the meat and throwing it in the oven for 30 minutes. The flavor that the honey mustard creates, though, is the wonderful thing about the dish. We had the chicken with the pan drippings which made a delicious sauce, or they can be made into gravy. I went to the nearest grocery store which happens to be Lund’s and Byerly’s. If you live in the Twin Cities you know the name. They are the Neiman Marcus of grocery stores around here. They are somewhat overpriced on a lot of their items, but they had some delicious looking organic, free range chicken thighs. They were probably a couple dollars more than the other stores, but chicken is really reasonable as it is. And, being free range and with no additional additives to them, even Amy, the vegetarian who eats her own homegrown chickens, ate a thigh. (She had to go to the company’s website to check them out first. She said the chickens looked happy)! I browned and baked the thighs in Amy’s cast iron Le Creuset cherry red skillet which does a marvelous job. 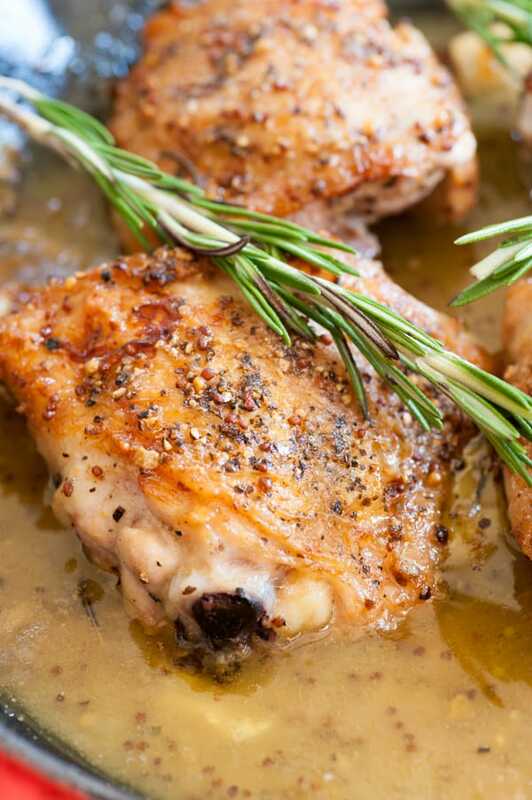 Serve the baked honey mustard chicken and it’s pan drippings over some garlic mashed potatoes with a side vegetable. It is the epitome of Yum! Easy to assemble and bake chicken dish. Serve with mashed potatoes or rice. Rinse chicken and pat dry, then salt and pepper all sides. 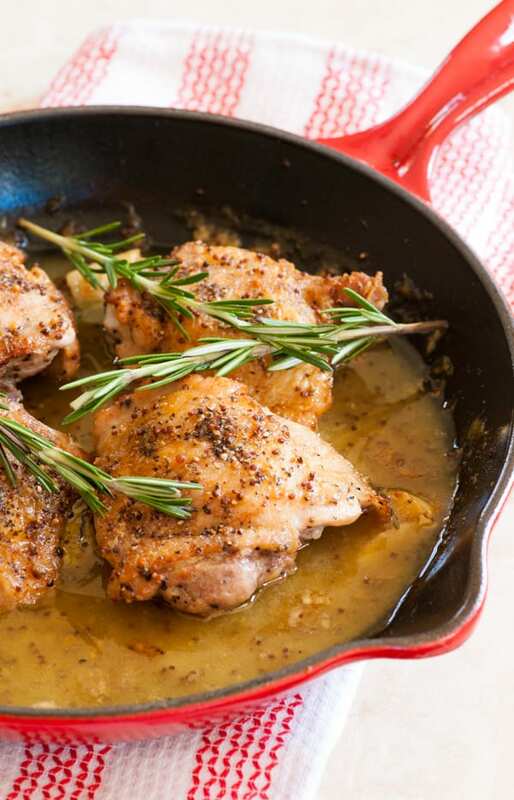 In an oven safe skillet on high heat, add vegetable oil and bring up to nearly smoking, then add chicken, skin side down and brown for 4 to 5 minutes. Turn the chicken and brown the other side 4 mins. then remove from heat. Mix the mustard, honey and wine in a small bowl, then pour over the chicken. 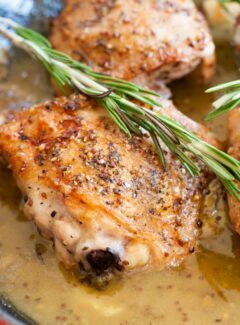 Place the crushed garlic and rosemary sprigs between the chicken pieces. Serve right away with the pan drippings. 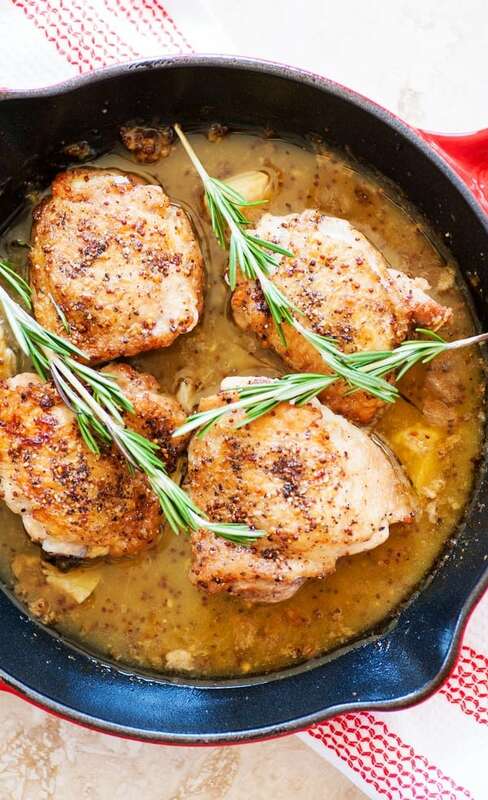 If you would like to thicken the pan drippings into gravy, remove the chicken and place the skillet on medium heat. Make a slurry of 1/4 cup of cold water and 2 tablespoons of flour. Whisk the slurry in to the pan and cook and stir until thick. Made this on the stove but with pork tenderloin tonight and it was delicious! Even the little kids devoured it. Thank for the recipe! Thanks Anne..I’ll have to try it with pork! Sounds wonderful. Will try soon! Lovely dinner, and even the skin was delicious. This sounds great, and looks even better! I don’t know if it is your new camera that makes it look so good, or the fact that I like chicken. Guess what part of the chicken is my favorite? Your are correct, it is the thigh. Good job Joe!!! It is really tasty Al…kind of a change of flavor for chicken. It hardly takes any time to make. And, while I’m still learning my new camera, yeah, it takes great photos. I will definitely be making this again in the future- it was so good! !